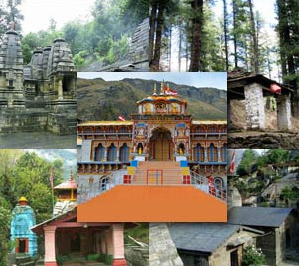 The temple of Bhavishya Badri is at an elevation of 2744 m and is surrounded by dense forests. Located at Subain near Tapovan about 17 km east of Joshimath on Joshimath – Lata – Malari route, pilgrims have to trek beyond Tapovan, up the Dhauliganga River. Tapovan has sulphurous hot springs and the view of the Tapovan towards the north is simply breathtaking. It is believed that when Kaliyug comes the mountains Jay & Vijay at Patmila near Vishnuprayag will collapse, so making the present shrine of Badrinath inaccessible and Lord Badrinath will be worshipped here. Thus the name Bhavishya Badri which literally means the Badri of the future. Bhavishya Badri is popular even now, enshrined here is a lion headed image of Narsingh. Getting there: Jolly Grant at Dehradun is the nearest airport. 280 km away Rishikesh is the railhead. Bhavishya Badri is connected by a motorable road upto Sandhar (274 km from Rishikesh) and 19 km from Joshimath. From saldhar it is 6 km trek up to the shrine. The accomodation is available at Joshimath and Tapovan.